Purchasing with your major credit card via PayPal at any small "Mom n Pop" online store (like StarryMart) is significantly safer and more secure, because the merchant (Dr Z) never lays eyes on your credit card number. Fulfillment of all orders in Dr Z's StarryMart is via email. Fulfillment of most orders through PayPal is normally within 7 calendar days. Interpretative reports are most typically sent within 24 hours, while personal readings obviously take longer. All interpretative reports now come in the form of a multi-platform PDF file read with the free Adobe Reader. Choosing a House System for your report and/or reading. Here's why Dr Z prefers the Koch House System. Important! there's also a much fancier, bigger, and more tempting button that says "Check Out with PayPal." To pay, using your debit or major credit card, then choose the: 1. very plain "Check Out" option. You will be paying with your debit or major credit card as a "PayPal Guest." Of course, if you do want to pay using your PayPal account, then choose the 2. option with the fancier, bigger, more attractive "Check Out with PayPal" option. Computer Generated Astrology Reports: Why offer computer generated astrology reports? Why fork out the bucks for an astrological report or reading? Personal Horary Reading - Need a burning question answered? Then Horary might be for you! Find out more - 29.95 USD; I've never heard of a Horary reading? Personal Electional Reading - Opening a business? Planning a wedding? Want to select the best possible astrological time for starting your endeavor? Then Electional is for you! Find out more - 59.95 USD; What in the heck is an Electional reading? Who In The Heck Is Dr Z? In 2018 Dr Z doesn't think of himself as a "stranger." 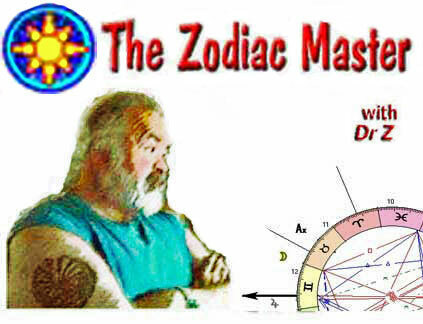 After all, his site The Zodiac Master has been continuously on the internet since September 1996. Dr Z's The Zodiac Master was 1 of only 10 astrology sites selected for review in the Nov 98 Edition of Yahoo Internet Life Magazine! The Zodiac Master was also honored to be one of the first sites reviewed by the Mountain Astrologer Magazine. For 7 years, from 6/99 to 7/06, Dr Z maintained the astrology guide site at About.com (at the time owned by the NY Times). During those years, Dr Z's guide site was the top educational hub for astrology enthusiasts on the Internet.